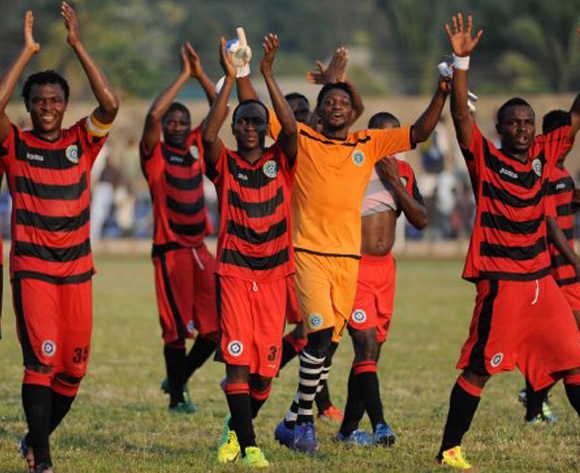 Lobi Stars FC, based in Makurdi in central Nigeria, had a truly wonderful season, finishing as number three in the Nigeria Premier Leauge 2012. The so-called “Suswan Boys” is a strong, hard-working collective, consisting of a sound mix of experienced performers and talented youngsters. Don’t be surprised is several of the players mentioned in this report will change teams during the current transfer window – there are both Nigerian and foreign clubs lurking around some of the best players of the team. The experienced John Lawrence, formerly of Enyimba FC, was first choice goalkeeper during the season. Lawrence had a brilliant season, making several match-winning saves. Terhemen Akombo, also an experienced goalkeeper who has been with Lobi Stars FC for at least seven years, was the regular backup for Lawrence. Terkaa Melai was third choice goalkeeper. In defence, Anthony Agbaji, Ezekiel Bassey, Terna Ikpeen and Moses Bunde were the main men. Bassey, comfortable at left-back or as a central defender, got some rave reviews during the season. Bunde is a utility player who performs brilliantly at centre-back or as centre forward. Bunde, who was training with the Super Eagles, the Nigeria national football team in 2010, is arguably one of the most important players at the team. Ikpeen, a central defender or defensive midfielder with excellent ball control and vision, was often captaining the team. Samuel Iorwuese Utsaha also made some promising performances in defence. The midfield of Lobi Stars FC was arguably the strongest asset of the team. The hard working Moses Orkuma was important for the balance of the team. Yesterday, Orkuma played the whole match as the Flying Eagles, the Nigeria U-20 national football team, played 1-1 against South Africa U-20 in a qualifier for the 2013 African Youth Championship. Blessing Okardi (born 05.11.1988) is a box-to-box midfielder who runs for 90 minutes everytimes he plays. Anthony Abawula (born 23.08.1990), signed from Kwara United FC, is another great option in midfield. Youngster Emmanuel Ajia, often found in midfield, is a player with tremendous potential. Esosa Igbinoba, usually one of the first names in the team sheet, struggled a bit with injury during the second part of the season. The importance of veterans Jonah Abutu (born 27.07.1988) and David Tyavkase (born 30.12.1984) can not be underestimated. Abutu, formerly of Dolphins FC, has tremendous strength, which he uses to win back the ball, make room for others or to force his way through any defence. Tyavkase, often associated with his stint at Enyimba FC, is arguably the maestro of the team. His intelligence, vision and smooth distribution of the ball made him one of the top performers of the Nigeria Premier League 2012. Both Abutu and Tyavkase scored six league goals during the season. Lobi Stars FC lost two important players during the mid-season transfer window. Veteran midfielder Lazarus Chukwu joined Warri Wolves FC where he became somewhat of a fringe player while the talented attacker Gabriel Adikwu joined Shooting Stars FC and had a wonderful season. Winger Nelson Friday Nimyel joined Kaduna United FC in April 2012. Top scorer of the team was the red-hot Tony Okpotu. The burly teenage striker or winger scored eight goals, six of which were scored during the second part of the season. Okpotu has scored 13 goals for Lobi Stars FC since making his debut in 2010. The versatile Chimaobi Nwaogu, formerly of Enyimba FC and Wikki Tourists FC, was important for the attacking play of the team, especially during the second part of the season. Behind Okpotu and Bunde, whenever he played up front, no striker caused any waves. Henry Akile (born 22.12.1987), formerly of Wikki Tourists FC and Al-Gouna (Egypt), was probably unhappy with scoring just two goals. Sarki Audu and Luter Iyorhe both showed a lot of promise and these strikers could head for more goals during the up-coming season. Attacker Sunday Johnson, formerly of Kaduna United FC, joined Lobi Stars FC during the mid-season transfer window. Other players that featured during the season include Terkimbi Akosu, attacker Hillary Chukwu (born 24.05.1984), defender Terwanger Forgive (born 03.08.1986) and Timothy Imenger. Tony Okpotu 8, Jonah Abutu 6, David Tyavkase 6, Moses Bunde 4, Lazarus Chukwu 3, Gabriel Adikwu 2, Henry Akile 2, Luter Iyorhe 2, Moses Orkuma 2, Emmanuel Ajia 1, Sarki Audu 1, Ezekiel Bassey 1, Sunday Johnson 1, John Lawrence 1, Chimaobi Nwaogu 1, Blessing Okardi 1, Samuel Iorwuese Utsaha 1. The picture was found on MTN Football. Lobi Stars striker Tony Okpotu has joined Al Ittihad Tripoli of Libia. 19-year-old has signed a two-and-a-half-year deal valued at about $360 000 with the 16-time Libyan champions.